Tickets for the three events surrounding the 2019 Southern League All-Star Game will go on sale Wednesday, April 17 at 10 am. Fans will be able to purchase tickets to the Opening Night Gala, All-Star Luncheon and Postgame Party. 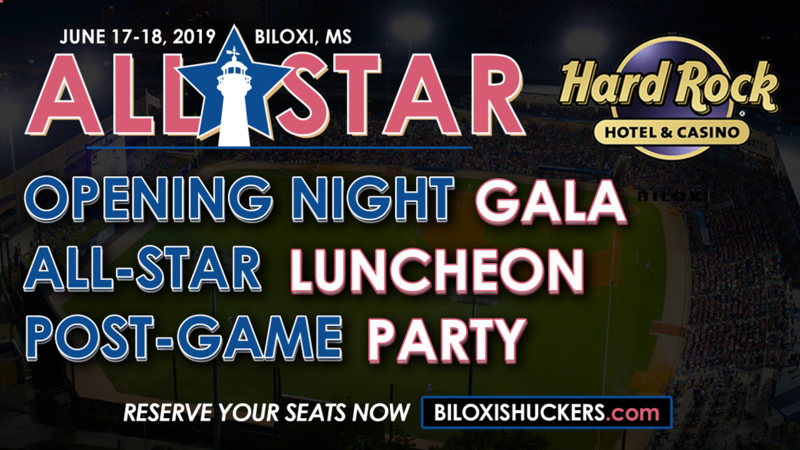 All three events will take place at the Hard Rock Hotel & Casino Biloxi, the official hotel of the 2019 Southern League All-Star Game. Members of Shuck Nation will have access to an exclusive presale on Monday, April 15 starting at 10 am. Following the Home Run Derby, the All-Star Game gets kicked off with the Opening Night Gala. Players, coaches, front office members and fans will gather at the Hard Rock Pool at Hard Rock Hotel & Casino Biloxi for the introduction of both rosters and Opening Night remarks. Tickets are $50 and include food and beverage for the evening. Dress is business casual and space is limited. Before the players square off in the All-Star Game, the official All-Star Luncheon will take place at Hard Rock Live. There will be a key note speaker and the 2019 Southern League Hall of Fame class, including Roy Halladay, Sal Rende, Larry Walker and Joe Engel, will be inducted into the Hall of Fame. Tickets are $50 and include lunch. Dress is business casual and space is limited. The All-Star festivities come to a close with a postgame party at Boogie Nights located inside the Hard Rock Hotel & Casino Biloxi. The party gets started shortly after the 2019 Southern League All-Star Game concludes as players, coaches, fans and executives from around the Southern League celebrate the end of the All-Star events in Biloxi. Tickets are $30 and include drinks and hors d'oeuvres. Come ready to dance the night away with the best in the Southern League! The 2019 Southern League All-Star Game will take place at MGM Park on Tuesday, June 18 at 6:35 pm. Fan Fest gets things rolling at MGM Park on Monday, June 17 starting at 3:00 pm, culminating in the Home Run Derby at 5:30 pm. Tickets for both the Home Run Derby and All-Star Game are on sale now. The Biloxi Shuckers are the Double-A Affiliate of the Milwaukee Brewers. The Shuckers play at MGM Park in Biloxi, Mississippi and will host the 2019 Southern League All-Star Game on June 18. For more information please visit biloxishuckers.com and follow us on Twitter @biloxishuckers and at facebook.com/biloxishuckers.